Hey you bloggers we are back again with another stunning interview session! As part of our BloggersIdeas interview series, today we have Professional Affiliate Marketer & Event Consultant Avinash Mishra and he is the founder of Noise Digital Media. He is one of the keen affiliate marketer who is making his living from online income. He is doing crazy stuffs with SEO & blogging, driving traffic to your blog and building relationships with corporate. First of all thanks a lot for accepting my interview proposal. I and my readers are very pretty glad to have you . Please tell us about yourself and your educational background. Well! Currently I have completed my graduation in Electronics & Communication Engineering. In 2012, I’ve started my dot com journey with my very first blog www.makemenoise.com then I started learning a lot and experimented over various ways to make money online. On 15th August, I have launched my new blog (TheAvinashMishra.Com). Last year I have launched my digital media company i.e., Noise Digital Media through which I offer digital marketing services along with Event Management consultancy service. On 30th August 2014, I have successfully organized India’s one of the biggest Social Media Summit in Delhi. What are your favorite social media tools? Which tools do you prefer to use to increase user engagement? According to me, I think communicating directly with people is the best way to engage users. Provide quality contents to your visitors, if they trust you then they will follow you and ultimately you are going to leverage potential users. It’ll increase long term engagement. At the end, I have taken Engagor.com service to engage users on social media. Do you fear the possibility of web surfers having their browsers to auto-clean cookies at the end of every browsing sessions? What if this becomes a default feature on browsers? If I am doing affiliate marketing then I must set my mentality about such issues. I simply focus on quality of my work. Write content for users and I am must sure they will care for your effort. These days I am getting good conversion with e-junkie products. CB is the best place for affiliate marketers. What is the best way to make money from ClickBank platform. Please throw a light on this? Before I answer this question, I’d like to ask you a question. Which is more important, Water or Food? What will you give answer of above question? You might say WATER, right? How will you cross-check whether your SEO campaign is working or not? Successful SEO campaign is directly proportional to good number of visitors for your selected keywords. I use my websites statistical data to track my SEO campaign. There are various ways to check out SEO campaign for particular keyword, I go through Google Webmaster tools, Google Analytics tool and Jetpack by WordPress for frequent analysis. Give useful suggestions when company rebranded ? Suggest some crucial points while rebranding . Rebranding is simply transforming name, symbol, image and some other factors of established brand into new one. It is one of the types of strategic marketing. What type of content marketing should be done in case of rebranding? Will press releases help. Of course Press release will help you to rebrand your business. We can ask bloggers and other webmasters to write a review over our brand. We can organize a promotional event. We can do giveaway too. On how many social media accounts you are active on, please tell us ? I am active on almost all social media sites. Anyone can connect with me everywhere. Do you think referral traffic helps in rakings on SERP. ? What are your thoughts on this ? Neil Patel says social sharing or getting referral traffic is a new kind of SEO. These days social share counter is really a very determining factor as per my experience. Referral traffic does not contribute much in SERP (little bit contribution) but it is good to increase page views. One more thing, we should keep in mind that huge referral traffic only works when we are posting relevant, authentic and helpful content on our blog or website. Which is your favorite email service provider, what kind of email management tools you use? I use Mailchimp services for my email marketing campaign. How to make money from amazon affiliates ? Guide us through it in brief. Promoting amazon product really let you make good amount of money. You just need to follow proper promotional structure. I am planning to promote amazon products. I generally follow above affiliate marketing promotional structure. How to make blog a brand among the top competitors in blogging. Well! If we are into blogging then our main motto must be sharing helpful and relevant content among readers. If we want to make blog a big brand then only thing works well is sharing high quality CONTENT, overall “Content is still King”. Apart from good content, we must be active to moderate comments and replying in a gentle manner. We should focus on social media management. We should help newbies. We should be active in question & answer session in blogging groups. Do you have suggestion for my blog, what things you didn’t like in bloggersideas, be frank ? I like contents on your website. You are good in SEO. Your blog lack little bit in design. I’d like to suggest you to make home page more attractive. If you have any questions about this interview, please do ask in the comments below ! Dont forget to share this awesome interview in social media. I will be pleased if you share this now ! Join BloggersIdeas on Facebook, Google+ & Twitter . You are doing very well in online world and one can learn so much from you about affiliate marketing and branding. I rarely ready interviews online, But to know more about Avinash I read this awesome interivew, Avinash is my good friend and you can call him perfectionist. 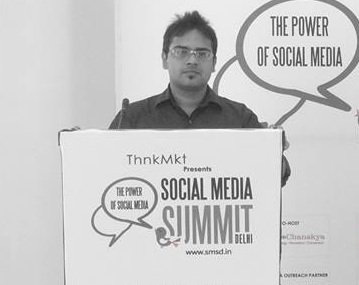 In yesterday’s Social Media Summit 2014, the whole management was done by Avinash and his Team. Thanks Jitendra (Former Darren Rowse) for the Interview..
All the best both of you! 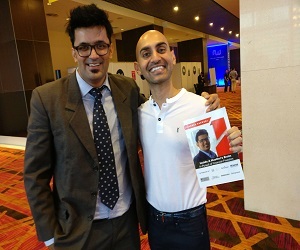 Hi Avinash….Great insights about Social Media and Internet Marketing!! Thanks for sharing such awesome things. In my next time, you must come. As a senior I have proud on your work Somesh. Good to know your various talents through this interview specifically Affiliate Marketing. I appreciate your efforts for social summit. Wishing you to achieve more success. Congratulation Avinash for your Summit. You are doing great in internet market. Even I missed this event, I will try to be present in your next event. keep it up and reach on your top ambition. Nice and Inspiring, appreciate the tips included. I don’t have much knowledge on SEO and Affiliate marketing, but the tools which he pointed here may help me too. Great post and info! I would love to comment on theoretical portion apart from water and food! I would just say, a good proportionate on your snacks much more important when we do PPC 🙂 Isn’t that true? Yes, It is 100% true. I am glad that you have concentrated on my words.